During the twelfth and thirteenth centuries, travelers Ibn Battatu of Morocco, Xuanzang of Sui dynasty China, and Marco Polo of Venice, Italy began to explore and document alien civilizations. 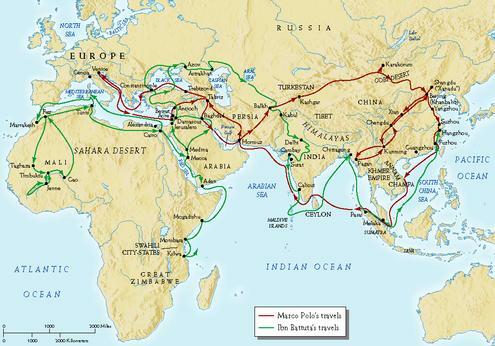 Together, Battatu and Polo explored much of Eurasia and Northern Africa while Xuazang took on India- successfully uniting east and west into a single, accessible network of goods and ideas. These travels mark the beginning of the age of exploration, which led to the discovery of the Americas and other voyages by people such as Ferdinand Magellan and eventually Lewis and Clark. 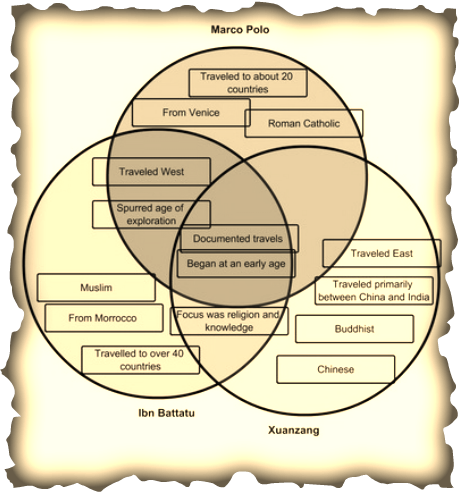 While they came from very different backgrounds and had entirely different motives, the relationships between inter-regional travelers Ibn Battatu, Xuanzang, and Marco Polo are uncanny. It is by analyzing these similarities and differences that one can gain a better understanding of the process through which the world began the slow process of globalization and unification. One cannot ignore the fact that all three of the travelers contributed to the connection between east and west, which led to the globalization seen today. Furthermore, all the explorers documented their travels and began exploring at a very early age. All these characteristics were vital to explorers in the twelfth and thirteenth centuries, and it is through these criteria that one realizes the first most important trait of the explorers: education at a young age. For example, Ibn Battatu received the best possible schooling during his years growing up in Morocco. Xuanzang was trained as a Buddhist Monk, and could therefore read and write at the highest possible level. Polo was well educated, and learned merchant subjects including foreign currency, appraising, and the handling of cargo ships, although he learned little or no Latin. All of them knew how to document their travels for future generations, and all of them began schooling at an early age. This is important because travel in this time period required a great amount of strength, endurance, and time because of lower life expectancies. The travelers, while similar in some ways, had extremely different backgrounds. Ibn Battatu was born into a Berber family of Islamic legal scholars in Tangier, Morocco, while Xuanzang was raised by his Confucian father during China’s Sui dynasty. Little is known of Polo’s childhood, but it is thought that he grew up in Venice, Italy as the son of a merchant. While Battatu was a Muslim, Xuanzang grew up a Confucian who later converted to Buddhism, and Polo practiced Roman Catholicism. At times, their differences seem to overshadow their similarities. However, one must remember that the results of their exploration were similar: increased globalization, communication, and trade. When comparing the three travelers, several aspects of their exploration become immediately apparent. It is clear that Ibn Battatu traveled the greatest distance by far, with Polo 20 countries behind him, and Xuanzang taking up the rear. They all interacted heavily with foreign civilizations: Battatu with the Chinese, Polo with the Mongols (and others), and Xuanzang with the Indians. They all acted as vital ambassadors for their individual countries or cultures. The travelers Marco Polo, Xuanzang, and Ibn Battatu all exhibited a certain set of characteristics, but they also were different in many ways. It was through this variety and diversity that the spread of goods and ideas could more actively spread through a spectrum of different civilizations and cultures. Furthermore, the effects of these travels are still apparent today. New forms of ART such as the use of silk was discovered through the exploration of the far east. Scholars and travelers were also better able to map the GEOGRAPHY of the previously uncharted east. MILITARY power was affected through the interactions of Marco Polo with the Mongols. SOCIAL expectations changed as people valued exploration to a higher degree. POLITICAL influence became more widespread as explorers acted as ambassadors began to spread political values across borders. RELIGIOUS values shifted as Polo and Battatu spread Christianity and Islam respectively. INTELLECT and the spread of ideas increased exponentially through the Silk Road, as proven by innovations such as silk, language, and spices. TECHNOLOGY also increased as the Mongolian weapons, Chinese gunpowder, and European sword-making techniques were interchanged. Because of the facilitated form of trade provided by the Mongols, ECONOMIES boomed as goods were exported and imported like never before.